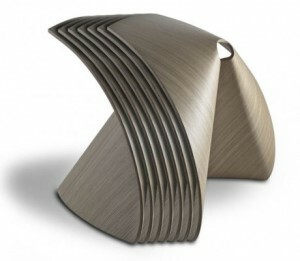 Shin Azumi forÂ Lapalma has designedÂ a fortune cookie-shaped chair which was presented atÂ Imm Cologne 2011, though there has been some controversy about it since then. According to Swiss Miss, it is built from a single sheet of plywood. While it looks fragile, it’s actually incredibly stable, thanks to the clever weight distribution achieved via a specifically shaped contact area with the floor. It probably wasn’t purposely fortune cookie shaped, but the resemblance reminds us just how elegant the fortune cookie shape is.